Freddy is synonymous of sport and passion for the movement. Born in 1976 it has established itself immediately as a leader in the creation of professional footwear for dance and gymnastics evolving, with the passing of the years, with a complete apparel collection. 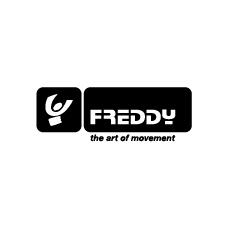 A story made up of milestones and new challenges, like a great sporting accomplishment, that brought Freddy to be a reference not only in fitness but also in fashion.. Freddy's strength is expressed by its uniqueness, or its philosophy: the "Art of Movement".